Gon is the son of Ging Freecss, a legendary hunter whose current whereabouts are unknown. He never knew his father was alive, much less a hunter until he met Kite; a hunter who was also looking for Ging. From this point on, he became determined to find his father and decided to take the Hunter exam to do so. He became friends with Killua almost instantly when they met at the Hunter exam. 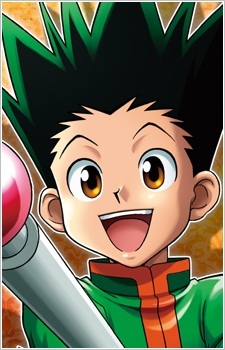 Gon's an innocent boy who is willing to help anyone, especially his friends. He rarely ever looks at anything in a bad way. His curious and naive personality often frustrates his friends but this is also the reason why many people are attracted to him. He is also from the enhancer nen group. He usually fights barehanded or with his fishing rod, but it is seen quite often that Gon's fist is more deadly than any weapons.